Shaky cam is a bit much but probably helps with hiding the stunt doubles. If you care about petty things like intellegent scripwriting and acting you probably won't like this. Despite (or because of?) 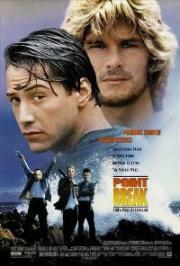 maximum 90s extremeness and peak wooden-Keanu this film was a ton of fun. Bigelow adds enough directorial touches to elevate the unspectacular script.